We finished the day on the Finger Lakes Trail beginning from Brink Hill. 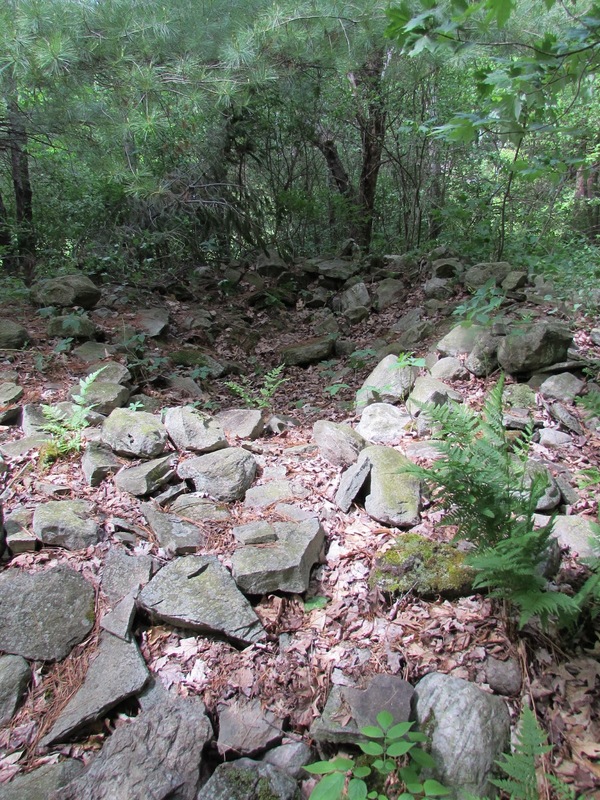 It was not long before we sensed energy in the air and started looking for stone mounds. Interestingly, I had a very unusual experience there. For a few seconds I blacked out. I did not fall down. It just seemed like someone turned the screen off I was watching--everything went black, and then I rebooted. It lasted only a few seconds. I was unaware during that time. Was it an out of body experience? Had my consciousness ascended to a higher plan? A pseudo near death experience? Or? The only comparable experience I can think of is when I was at the pyramids at Giza, in Egypt, 35 years ago. While I was riding around the pyramids on a horse I blacked out. The next thing I remember was finding myself about 150-200 yards from where I last remembered being. Again, my body functioned in the physical plane, but my mind was blacked out. I was not aware of anything during the time I was blacked out. 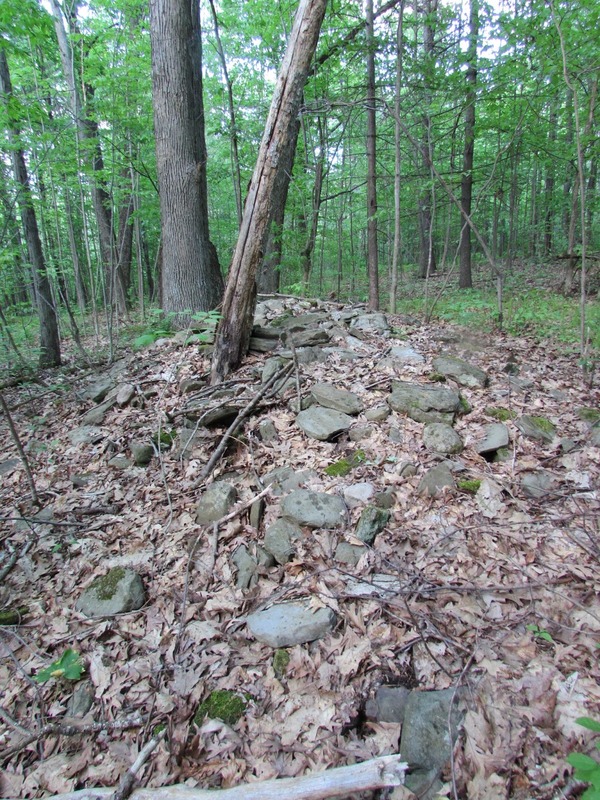 The stone mound was about 15 feet long and had a rectangular oblong shape. It covered a single series of 4 Earth Chakras. Another wonderful day at HI Tor, always exciting, always enlightening. You never know what you will find, or what sort of spiritual experience you will have, as I have posted on this blog many times before. I hope that you visit the sacred mountains in HI Tor NYS DEC lands. We found a very interesting stone mound near our destination point, the lean two, on this part of the trip. 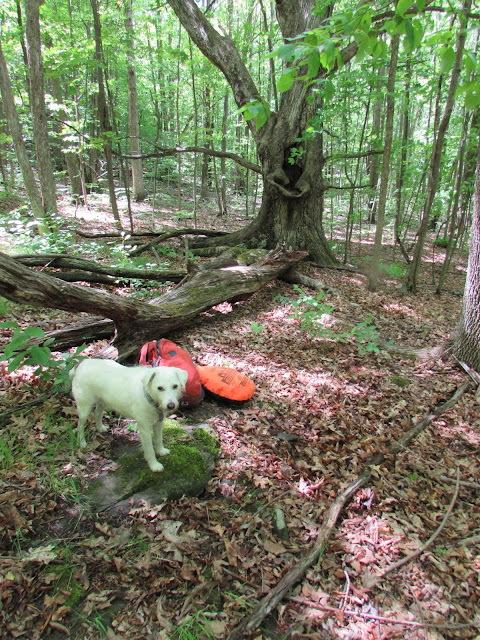 The pictures below show a circular oblong shaped mound about 20 feet in length and 4 to 5 feet high. Two series of 4 Earth Chakras each are located underneath, on either side of the mound. What was interesting about this mound was that it had a dimpled, or dug out center, about 2 feet deep. The hollowed out center was very well preserved. Incredible. We said a prayer and had a ceremony and spread some tobacco about. Unfortunately, much of the mound is covered by poison ivy. A larger stone towards one end of the sunken center appeared to be some sort of ceremonial seat. This is a guess; I only mention this because it was so much larger in comparison, and because of the way it was situated. A few feet away from the lean to is a spectacular view of Naples Valley. We walked back down and headed towards the Finger Lakes Trail on the other side of Brink hill. Since finding discovering Hi Tor NYS DEC Wildlife Mgmt. Area about a decade ago, I have spent little time exploring Parish Hill. And my focus was contained to the top along the Finger Lakes trail. So I took the opportunity this Memorial Day to explore Parish Hill. We started out at the bottom of Bristol Hill, at the parking area and climbed to the falls. The area of the falls, about midway up the hill provides for some spectacular views. 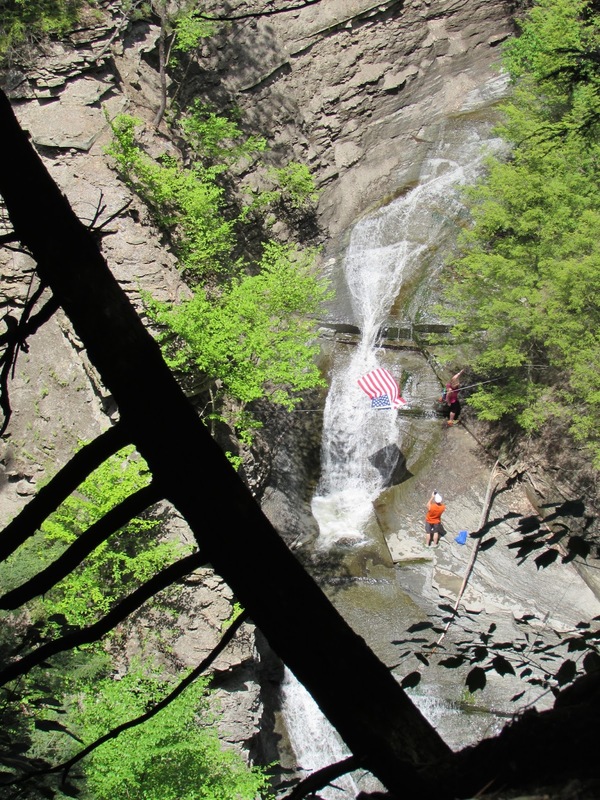 Interestingly, someone had taken to hanging a flag the bottom of the falls. On the hike up to the top and the view from the Lean Two area there was a very interested tree that looked like as if it were from the movie the Hobbit or someplace else mystical. 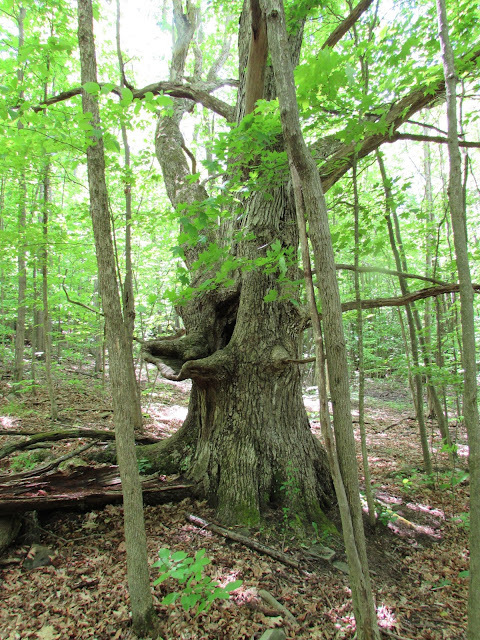 The tree has what appears to be a large bottom lip as the pick below shows. As often is the case a feature of Mother Earth may be close by, an indication that the tree is benefitting from it; or in hobbitspeak/fairiespeak, protecting it. There was a large stone place over the aspect. To highlight the stone I had my dog, Pepper, stand on it. We said a prayer and gave thanks and commenced our hike up to the lean two. 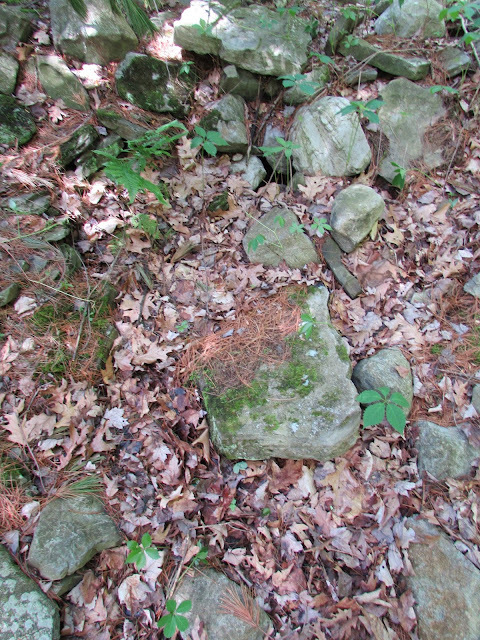 We went off trail several times looking for more stone structures and features of Mother Earth. Regrettably we found none.